Organic, Fair Trade, and adorable, to boot—what more could you ask for in a stuffed animal? If you’re after coordinating gear (think hats, mittens, blankies, and hoodies), Fair Indigo has you covered, as well. Handknit in a Fair Trade workshop in Peru using homegrown organic cotton, the online retailer’s collection of cuddly Joobles and matching baby accessories offers employment for hundreds of impoverished artisans. Fair Indigo even lends disadvantaged kids a helping hand through its eponymous foundation, which provides educational programs and supplies for the children of co-op workers. 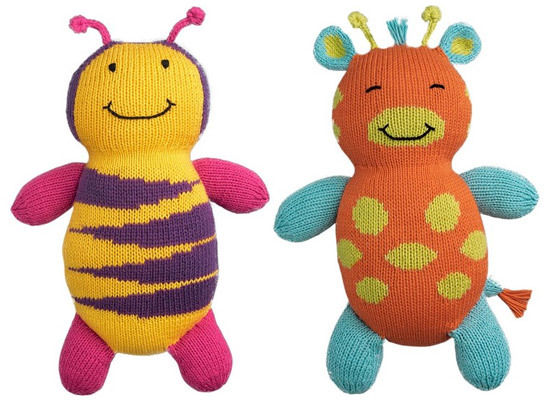 Organic, Fair Trade, and adorable, to boot�what more could you ask for in a stuffed animal? If you're after coordinating gear (think hats, mittens, blankies, and hoodies), Fair Indigo has you covered, as well. Handknit in a Fair Trade workshop in Peru using homegrown organic cotton, the online retailer's collection of cuddly Joobles and matching baby accessories offers employment for hundreds of impoverished artisans. Fair Indigo even lends disadvantaged kids a helping hand through its eponymous foundation, which provides educational programs and supplies for the children of co-op workers.